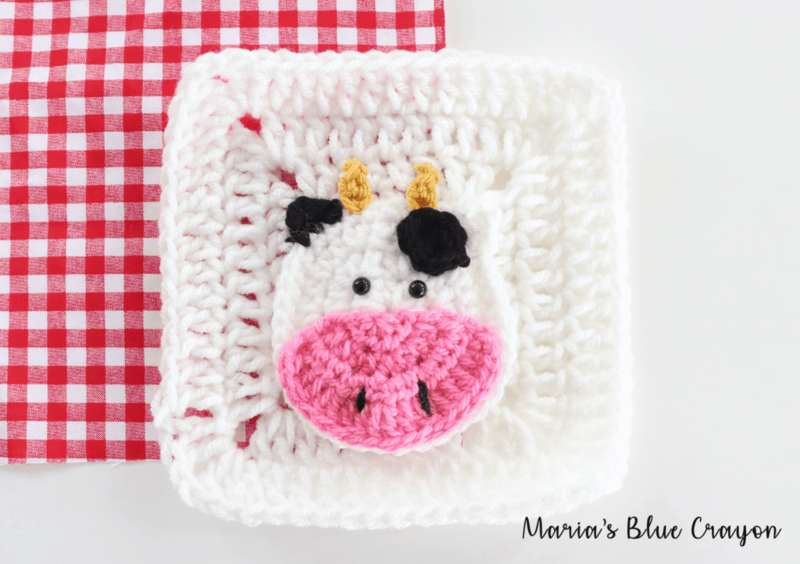 Learn how to crochet this cow applique as a part of the Farm Granny Square Blanket! Scroll down for both the written pattern and video tutorial. This crochet cow granny square is a part of my Farm Blanket Crochet Along. Round 4: Ch 1, sc in next 10 st, 2hdc in next st, dc in next 2 st, *2dc, dc in next 2 st, repeat from * 2 more times, 2hdc in next st, sc in remaining st. Attach white 5 st to the right of where round 4 ended on the head. Ch 1, sc3tog, fasten off. Attach black yarn 3 space to the left of where round 4 ended on the head. Make second ear using instructions above for the first ear. Attach yellow yarn 1 st away to the left of the right ear. Ch 1, sc, fasten off. Attach yellow yarn 1 st away to the right of the left ear. Magic ring, ch 1, 2sc, hdc, 2dc, hdc, 2sc, join to first sc, fasten off. Use black yarn and tapestry needle to sew snout onto head using the photo as a guide. Sew black spot onto cow head using photo as a guide. Sew cow onto white granny square.